Shopping for a new BMW 5-Series? If speed isn’t in your playbook (and it doesn’t have to be) the 530e is efficient, quiet, refined and best of all, discounted, when tax incentives are figured in. The 2019 BMW 5-Series luxury sedan doesn’t skate on its past accomplishments. 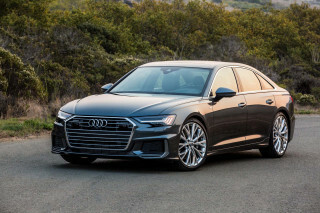 Two years removed from an overhaul for the mid-size sedan, this year’s version adds automatic emergency braking to its standard repertoire and deletes a diesel powertrain before it became even more of a leper in the States. This year, the 5-Series is available in 530e, 530i, 540i, and M550i xDrive variants that climb the ladder of performance and price. An M5 tops out both—it starts at more than $100,000—and leaves us so breathless that we’ve covered it separately. Base models start around $54,000, but that’s not the whole story—the 530e qualifies for federal tax credits and some state rebates that could push the final price below $50,000. The 5-Series hasn’t met an engine it doesn’t like yet. Base 530i and 530e models are fitted with a strong turbo-4 that makes 248 horsepower (the 530e pairs an electric motor and 9.2-kwh hybrid battery to make the same figure) and drive the rear or all four wheels. The 540i’s 335-hp turbo-6 is the next step up. Its power is more than ample with a 0-60-mph sprint of less than five seconds. The M550i xDrive reminds us of M-powered cars of yore, except for one key difference. Its 4.4-liter twin-turbo V-8 spins out more than 450 hp and rips off sub-four-second runs to 60 mph, but its standard all-wheel-drive system is a twist on those old, mean M machines. In every case, the 5-Series gets a standard 8-speed automatic transmission and good, but sometimes light, steering. The 2019 5-Series seats up to five adults, and it has a sizable trunk for their belongings. The cabin's become more stylish and more comfortable; no 5-Series looks thrifty, though dark cabin colors can get busy with optional stitching and ambient lighting. The IIHS called the 5-Series a Top Safety Pick+ last year and our opinion only improves this year: Automatic emergency braking is now standard. A suite of driver assistance features is a spend-up extra ($1,700) and they’re helpful; the 5-Series can stay centered in its lane for nearly a minute without driver input. That misses the point, though. Like other features in the 5-Series, the semi-autonomous drive feature complements the driver that’s already there. Likewise with the standard 16-way adjustable seats, two USB charge ports, 8.8-inch digital instrument cluster, 10.2-inch touchscreen for infotainment with Bluetooth connectivity and Apple CarPlay compatibility (free for the first year, but $80 for following years). The 2019 5-Series is the same, but the interior is better. If you haven’t noticed already, BMW changes looks less often than Julia Roberts. 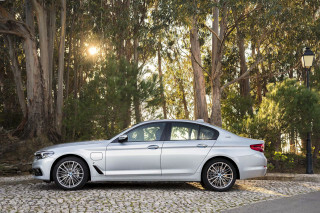 The efficient and performance powertrains that bookend the 2019 5-Series lineup also transform the BMW mid-size sedan from mild to wild. The 530i and 540i sedans are the most familiar in the middle, both sport a lower and tapered nose, sharper lines down the body sides, and less bulbous rear end. The 5-Series cribs some of the looks of the 7-Series, but gets its own details: sharper door creases, and chromed exhaust ports that finish off the 5-Series in its own way. The interior of the 5-Series is a little more daring, especially in certain colors. BMW uses multiple materials to visually separate the upper and lower portions of the interior with good effect; it’s mostly interesting without being distracting. When is it distracting? BMW’s liberal uses of contrasting colors can create busier interiors than we’d like—throw in quilted leather and we’re at a loss of where to look first. At night, BMW bathes the interior with soft ambient lighting that’s configurable depending on your mood. Powered by 4, 6, or 8 cylinders, there’s not a bad move to make in the 2019 BMW 5-Series. Base models have a good turbo-4 that we like here (and in other BMW cars) and the sedan still steers confidently with a smooth ride. Paying more gets more—at least as far as the 5-Series goes—but it doesn’t take long to spec a sedan for more than $75,000. 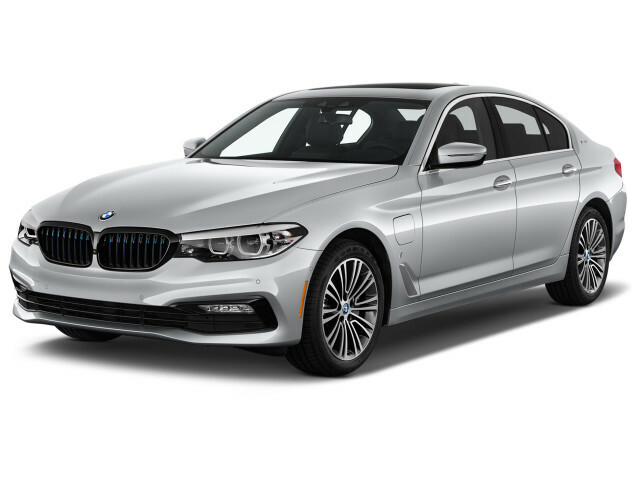 The base engine in 530i models is a turbo-4 that makes 248 hp and 258 pound-feet of torque that drives the rear wheels, or all four wheels when optionally equipped. Its enough to power the 5-Series up to 60 mph in around six seconds, which not long ago was mid-range for the bulky mid-sizer. We’ll take it. The 530i has a twin-powered twin: a similarly sized turbo-4 and electric motor paired to a 9.2-kwh plug-in hybrid battery. The net output is the same: 248 hp, but the plug-in hybrid 530e can travel up to 16 miles on electrons alone. (And qualifies for a federal tax credit and some state tax incentives that could make it the de facto entry-level 5-Series.) The 530e is just as brisk as the battery-less version, but the extra 600 pounds saddled to the 530e by way of batteries becomes apparent in cornering and weight transfer—hardly a nuisance, but also hardly svelte. A turbo-6 under the hoods of 540i versions makes it the next step up in price and performance. It makes 335 hp and 332 lb-ft and hustles up to 60 mph in less than five seconds in rear- or all-wheel-drive configurations. The turbo-6 serves up its meaty torque in a progressive way that belies its forced-induction engine; a decade ago the 540i was powered by a big V-8 with similar power delivery. We don’t miss the V-8 much. 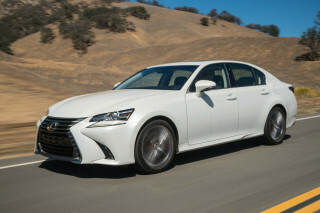 That’s partially because the turbo-6 is that competent, and also because the M550i xDrive sates our appetite for a throaty V-8 with its twin-turbocharged V-8. It makes 456 hp and 480 lb-ft and shoots the M550i xDrive up to 60 mph in less than four seconds. It’s only available with all-wheel drive for a good reason: that much power demands superlative grip. Most of our time has come behind the wheel of the 530e, which is at the opposite end of the M550i, but just as comfortable. The weight of the batteries helps, but also BMW’s optional adaptive dampers that are available on all powertrains and are standard on the M550i. The weight of the steering builds predictably but feels light on normal and comfort settings. In sportier modes, the steering and suspension work in concert to bring drivers closer to the road and in the middle of the car’s center of gravity—it’s one trick that sedans still have to lord over similarly powered crossovers. Although BMW offers active rear steering as part of a spend-up package, we’d advise some caution: Our experience with the system was mixed. For low-speed maneuvers, the rear wheel steering can virtually shorten the wheelbase for tighter circles by turning the opposite direction as the fronts. At higher (still legal, obvs.) speeds, the rear wheel steering can turn the rear wheels along with the fronts for better cornering, although we always felt like the rear wheels were “skating” behind us. We’re more enamored with the standard 8-speed automatic that’s fitted to all engines and powertrains—it’s that good. The 8-speed automatic BMW uses fires off rapid up and down shifts, and based on programmed drive settings, can react to our right feet faster than we can. 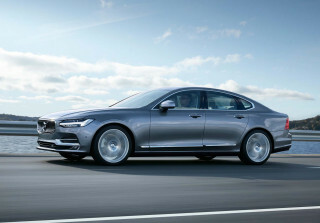 A slow-selling diesel sedan was shelved this year. Call it addition by subtraction. Few sedans are more comfortable and opulent than the 2019 BMW 5-Series. The 2019 BMW 5-Series does well on our comfort scale like a luxury mid-size sedan that costs more than $50,000 should. There are more comfortable cars on the road, but some of them cost magnitudes more than the BMW or have sliding doors. We’re saying you made a good pick, really. Base sedans are equipped with 16-way power adjustable front seats and synthetic leather upholstery. We’re more jazzed on the former rather than the latter, but accept that #LuxuryLife has a pecking order. The front seats are spacious and are upgradeable to heated, cooled, and massaging affairs that can be 20-way adjustable with soft nappa leather. In back, the split-folding rear seat is comfortable, especially at the outboard positions. Three adults across is possible; we’ve done it for several hours even. We like some shades of the optional leather better than others. Quilted patterns with contrast stitching get downright busy to look at, but lighter tones work well. In top trims (read: very expensive 5-Series models), the small details make a big difference. Seat controls with rubber grips, ceramic control knobs, and a touchscreen keyfob are all opulent details that propel the 5-Series into upper luxury climes, just be wary of the final cost associated with all of those creature comforts—they add up fast. Most sedans will offer 18.7 cubic feet of cargo room in the trunk, although the 530e’s plug-in hybrid batteries eat deeply into available space and leave only 12.1 cubes for suitcases or groceries. The 2019 BMW 5-Series now features standard automatic emergency braking to complement its impressive crash-test ratings. Even without a complete set of crash-test data, the 2019 BMW 5-Series does well on our safety scale. The IIHS called the 5-Series a Top Safety Pick+ in 2018 and not much has changed so we expect that score to carryover to 2019. This year automatic emergency braking with pedestrian detection, blind-spot monitors, and lane-departure warnings are standard on all 5-Series models. A Driving Assistance Plus package goes further with adaptive cruise control, active lane control, and cross-traffic alert. The system is designed to assist drivers, and reduce fatigue, but it reasonably holds the car in its lane for nearly a minute hands-free. BMW’s system is relatively good, and the automaker has made big promises about hands-free capabilities soon. At least for now, the 5-Series offers good optional extras that complement its impressive safety scorecard. A surround-view camera system and parking sensors are a spend-up extra, same goes for a night-vision system. A remote control parking feature can be added as well, but it stops short of Tesla’s “Summon.” The BMW system can only turn the wheel just a few degrees to pull in or pull out of a parking space. It’s best used for narrow spaces where getting in and out of the car could be a challenge. Few sedans offer as many options as the 2019 BMW 5-Series. Few automakers charge more, however. The potential for the 2019 BMW 5-Series is as deep as your pocket. Starting from around $54,000 to more than $110,000, the 5-Series’ range, speed, technology, and conveniences can be figuratively and literally breathtaking. There are myriad ways to configure one of BMW’s luxury sedan, so we can’t dive too deeply into what’s possible. The good news is that shoppers’ imaginations are one of the few limits. The bad news? Not much is cheap. Base cars are well-equipped, at least by luxury-car standards. Every model gets at least 17-inch wheels, a moonroof, dual-zone climate control, power-adjustable front seats, synthetic leather upholstery, a suite of active safety features including automatic emergency braking that we cover above, an 8.8-inch digital instrument cluster, and a 10.2-inch touchscreen for infotainment with Bluetooth connectivity and Apple CarPlay compatibility (free for one year). BMW adds three years of maintenance and a 4-year/50,000-mile warranty that's good among rivals. BMW offers the 5-Series in 530e, 530i, 540i, M550i xDrive, and M5 configurations. Those powertrains come with a handful of upgrades as the price, and horsepower, increases. We wouldn’t want for much at the base level because they come well equipped from Bavaria. We wouldn’t turn down a fully loaded M5 either, with a price that can quickly run past $120,000 and a powertrain that can run even faster. We cover it separately. - A $1,400 convenience package adds heated front seats, a power trunk lid, keyless ignition and satellite radio to 530 and 540 models. - For $4,200, the Bowers & Wilkins sound system sounds like bunch of money. After you turn it on, it sounds like one of the best audio systems we’ve heard in a new car—that still costs a bunch of money. - An active driving assistance package costs $1,700 and it’s one of the rare values that BMW offers. The system complements the standard active safety features with adaptive cruise control and active lane control that can help reduce fatigue in stop-and-go traffic or long-distance hauls. All-wheel drive is a $2,300 option on every model except the M550i, where it’s standard equipment. Leather upholstery is standard on 540i and M550i models. We have our qualms with BMW’s features, too. Apple CarPlay compatibility is now standard in every 5-Series for one year, but every year after the first costs $80. That’s confusing (and probably unnecessary) considering other automakers including Audi add the feature into the car’s initial cost, and don’t ask for more money each year after. It’s also worth noting that many of the 5-Series’ options are bundled into an hierarchical tier system that demands prerequisite items first like college-level chemistry. For example, a $700 package for a surround-view camera system and parking sensors requires satellite radio and heated seats first. More adjustable, and comfortable cooled front seats require nappa leather upholstery, which costs $1,000 more. And so on. BMW’s better about options packages than they have been before, but some of the features required for other features seemingly have little to do with each other. BMW’s infotainment system, called iDrive, was updated more than two years ago and remains one of the most powerful, but also frustratingly complex, systems to use. The 5-Series now features a touchscreen to help control the system, which makes the difficult-to-master rotary knob nearly obsolete. (Gesture control is a neat party trick, like winding your finger forward to turn up the radio, but it’s not very useful.) The iDrive system features a rich suite of connectivity options to let owners monitor their car using a smartphone app—it even takes a picture of its nearby surroundings, connect calendars, notify contacts when you’ll arrive, and help find a parking spot. It’s worth learning the system’s capabilities to see if it fits, although we understand that many owners will simply connect an iPhone and use Apple’s interface. At least for the first year. The diesel 5-Series is gone, but the BMW mid-size sedan offers plenty of options for efficiency or power this year. The 2019 BMW 5-Series sedan covers an unusually broad spectrum of powertrains and efficiency, just about every engine BMW makes is stuffed under the 5-Series’ hood. Adding all-wheel drive to the turbo-4-powered 530i shaves 1 mpg from the city and highway ratings. The 530e is more efficient. With a full charge, the EPA says the 530e can travel 16 miles on electricity alone. When the hybrid batteries are depleted, it rates 29 mpg combined. Adding all-wheel drive to the 530e slices 1 mile from its electric range and 1 mpg from its combined rating. The V-6-powered 540i rates 21/29/24 mpg, with or without all-wheel drive. From there, the efficiency goes down but fun goes up. The all-wheel drive only 2019 M550i xDrive and M5 use V-8 power, the former rates 18/25/20 mpg and the latter rates 15/21/17 mpg. All BMW 5-Series require premium unleaded. 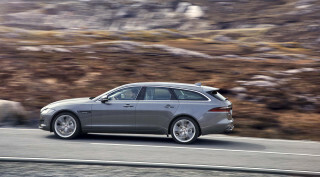 A slow-selling diesel version was shelved this year. Compared to its main rival, the Mercedes-Benz E-Class, the BMW holds its own. 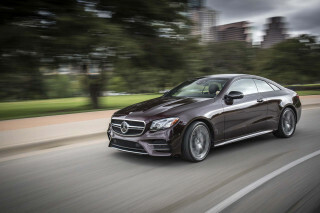 The most efficient E300 manages 25 mpg combined and the almighty E63 rates at 18 mpg combined. Looking for a different year of the BMW 5-Series?